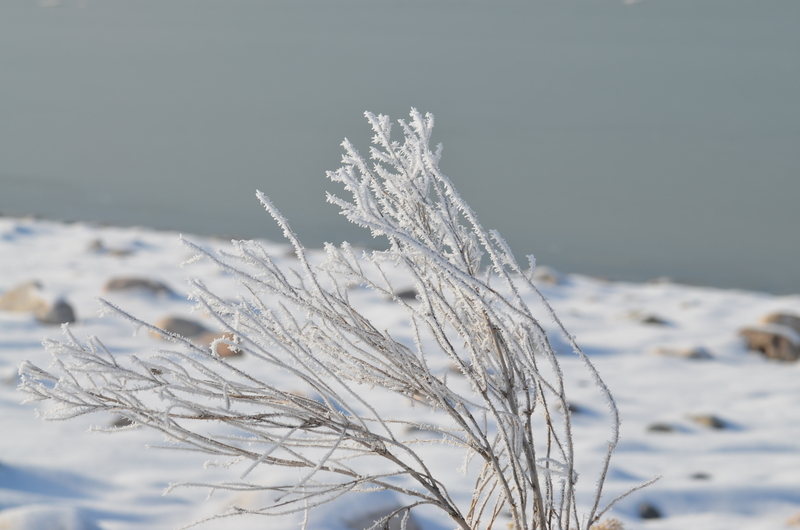 A pail of white paint has spilled all over Antelope Island. With the exception of the main road that has been plowed, the whole island is pretty much colorless. 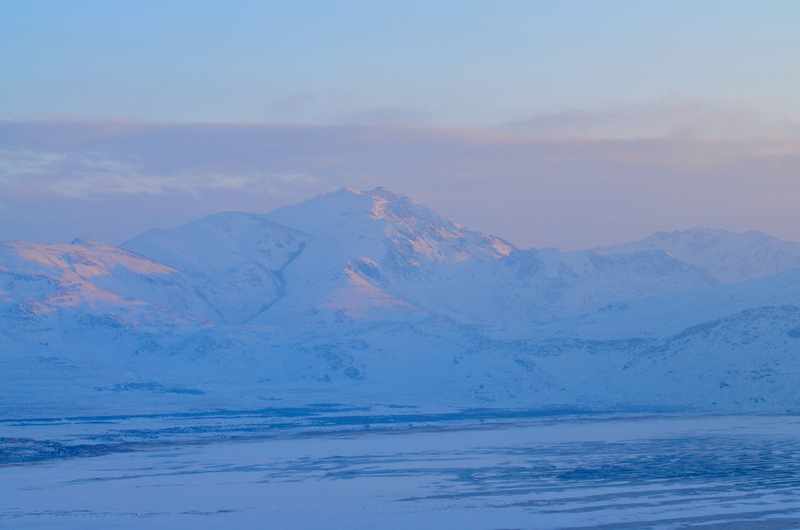 Far away–about 500 meters–I see a black speck on the snow. Steve gets his binoculars to his face before I even untangle the straps to get to mine. “Bald Eagle,” he says as it lifts off. Good. I think. Always good to see a Bald Eagle. Now, especially. There have been about 20 Bald Eagles in Utah that have suffered a mysterious death in the past several weeks. “Stay safe!” I want to holler out to the eagle as it flies away. It’s silent today on the island. The foggy inversion envelopes the island, sucking up any chance of color. I want to see Chuckers today, but I know better than to have a target bird at this time. 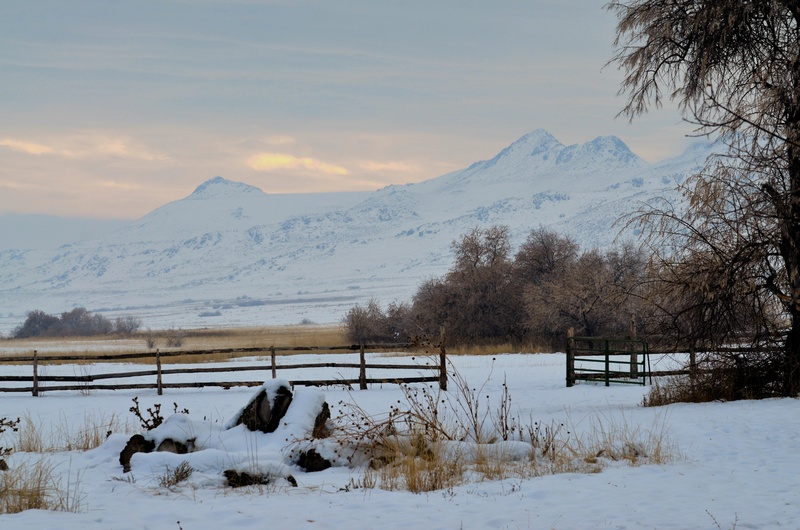 “Antelope Island is a place for surprises, not for plans,” I tell Steve as he rounds the corner away from the beach and toward Garr Ranch. I say this because it’s true and also because I am trying to manage my expectations for the day. Two cars are pulled over to the side. It’s so quiet here that I’m secretly annoyed to see others here. I want pin-drop silence and I’m feeling a little territorial. But alas, they’re here and they’ve spotted the monstrous black buffalo only five meters from the road. I suppose they’re entitled to look at the wildlife too. All alone in the snow. It’s a beast. Just looking at him, you wonder why the heat from his body doesn’t melt everything around him. He breaths through his nose like a locomotion, emitting steam into the air. I’m a little chilled with my window down and I want to warm my hands near his nostrils, wondering if he’d mind. 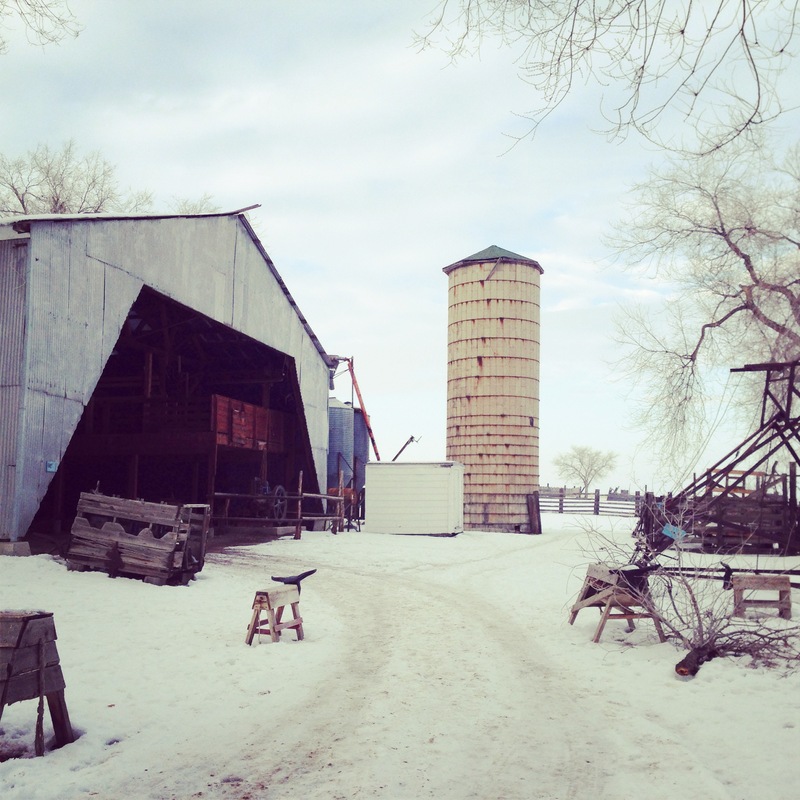 It’s not until we get closer to Garr Ranch that we start to see some surprises. There are tracks everywhere in the snow. Rabbit tracks, antelope tracks, coyote tracks. We finally spot a porcupine lump in a spindly tree, but don’t stop to take any photos. Then Steve slams on the breaks in the middle of the road and puts his binoculars up. “In that tree,” he directs me. 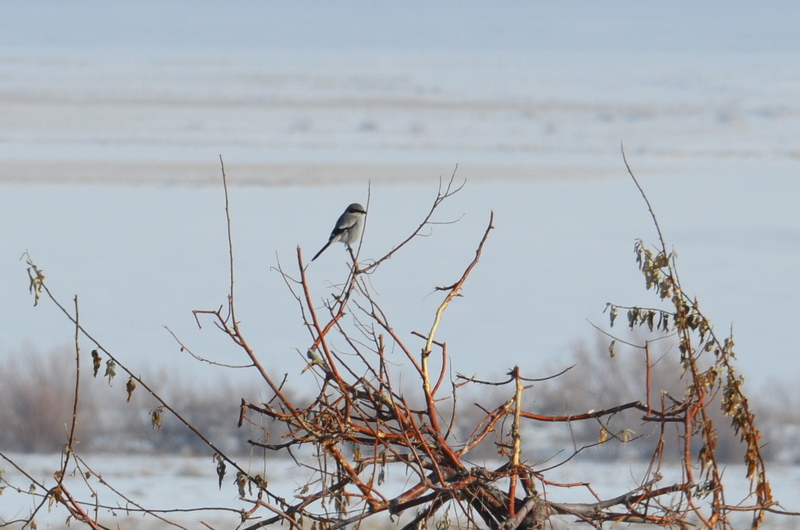 “That’s a Northern Shrike!” That’s a lifer for me and a delightful surprise. 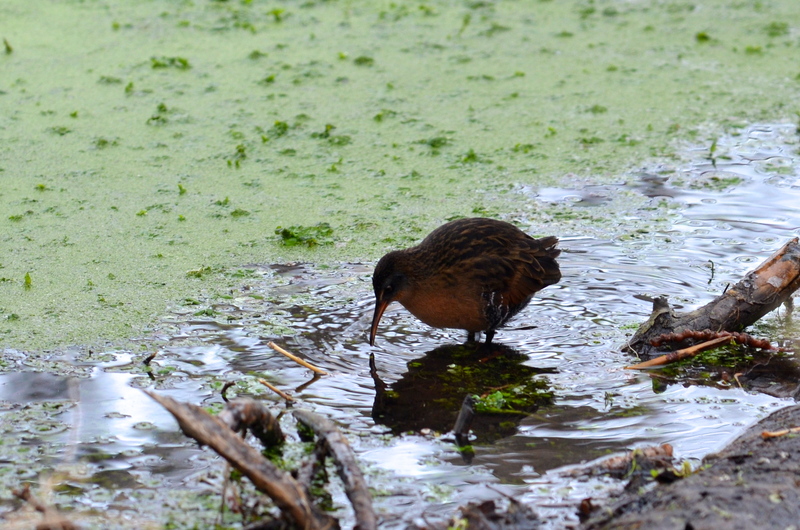 Not only that, it’s a rare bird for the area and we got to see it. 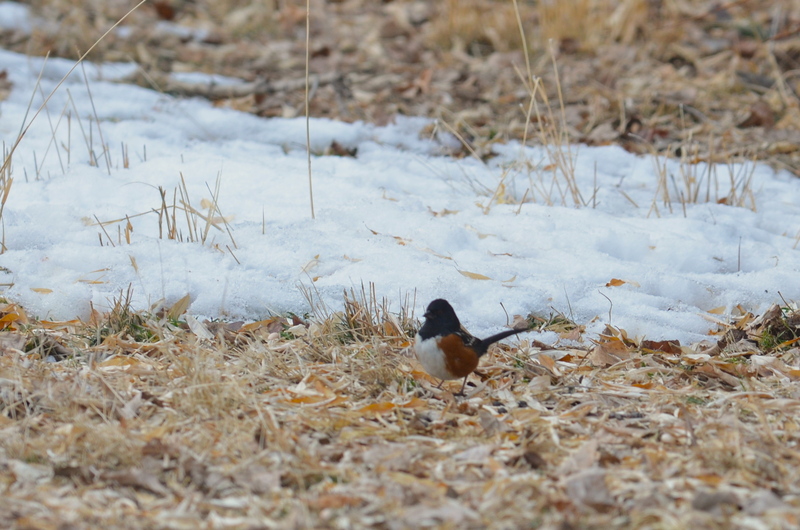 At Garr Ranch we walk around the grounds and find a Virginia Rail and a group of Spotted Towhees–six, to be exact, which is five more than I’ve ever seen at once. 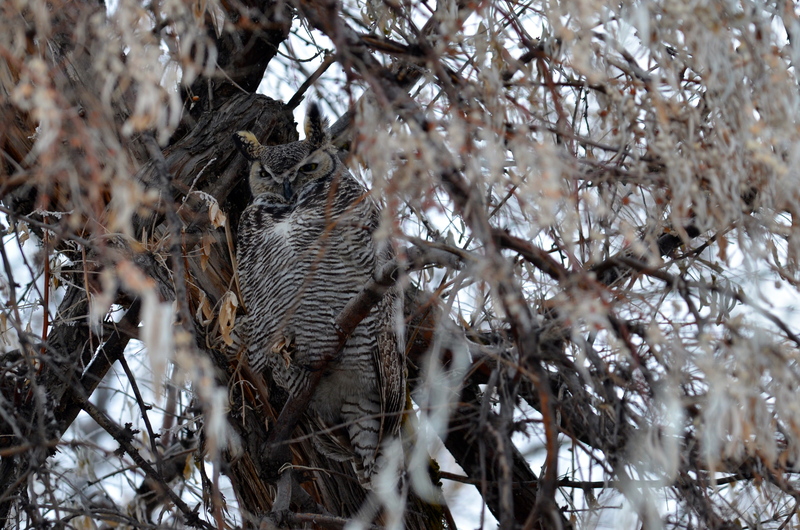 The other real surprise was getting a good look at the resident male and female Great-horned Owls. Sure, I’ve seen them before, but it’s like visiting old friends who are welcoming me into their home. Great-horned Owl (female) The male was in the tree next to this one, but hiding behind a lot of branches, making for a lousy photo. The sky starts to show a little color as the sun is beginning to set. A peach highlight over the mountains interrupts the vanilla landscape as it tries to simulate warmth. My fingers are tingling as we walk back to the car, so it turns out the peach sky is just a tease. 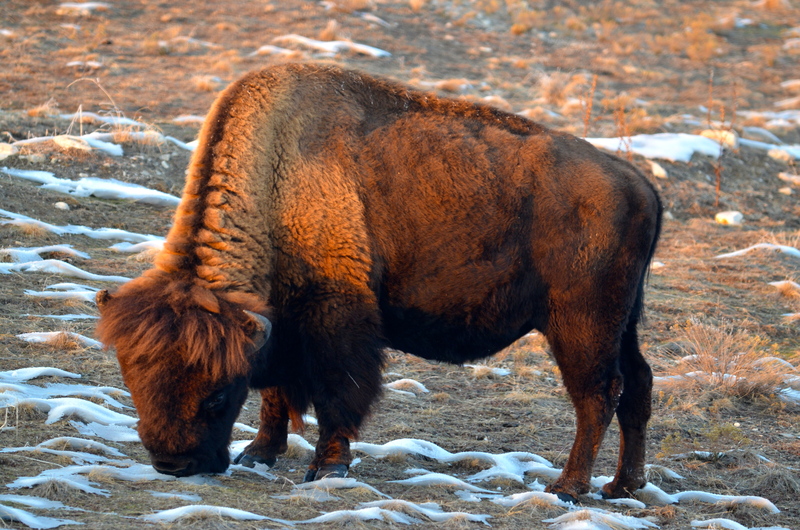 We drive toward Buffalo point and my eyes scan the landscape on both sides of the road. You have to pay attention otherwise you miss the surprises. “Hey! What’s that black spot over there?” I ask. “Over there on the frozen part of the lake.” Steve pulls over and we pull our binoculars up to our eyes. and Steve I.D.’s it. We keep driving and the porcupine is gone. There are no Chuckers today and I’m bummed. And then I see something moving on the ice. This time I’m pretty sure it’s not a rock. Ha! 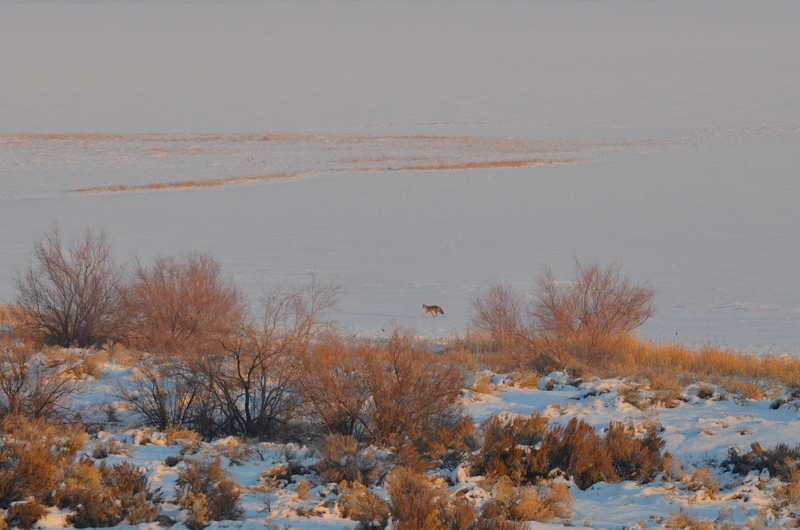 It’s a coyote. I would have liked to have gotten a closer view of him, but I was actually quite excited that we were getting good light from the retiring sun. We then head over to the buffalo paddocks on the island, thinking we’re going to find a group of buffalo. There were two hanging out near the paddocks but the paddocks were basically empty. Usually you see big groups of them all over the island, but they’ve mostly gone AWOL today. We typically visit Antelope Island earlier in the day, which means we don’t get the evening light. I was excited about the sun setting and the orange glow that was washing over the paper white island, so we then headed to Buffalo Point, which is the highest point on the island by road. To my left the light cast from the sun, gave the mountains depth and character and a radiance we’d not seen the past several weeks as a result of the winter inversions. 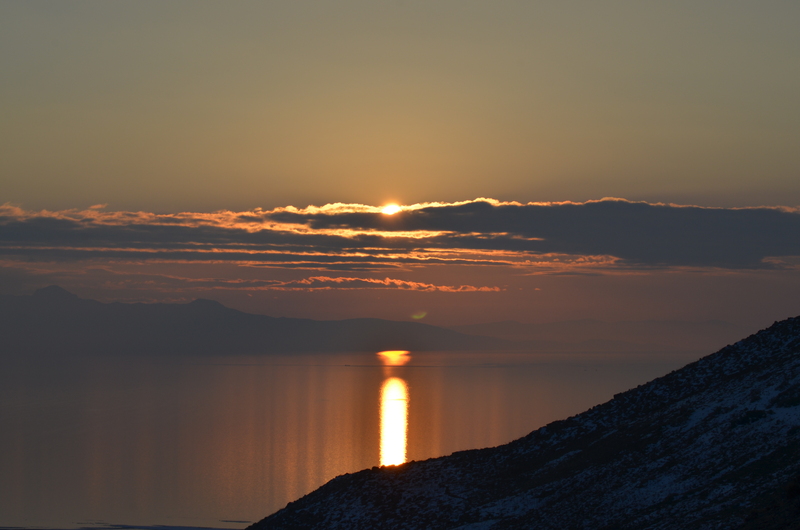 To my right, the fiery orange sun as it set over the Great Salt Lake gave me hope for warmth. It was a delicious combination of fire and ice on the island. 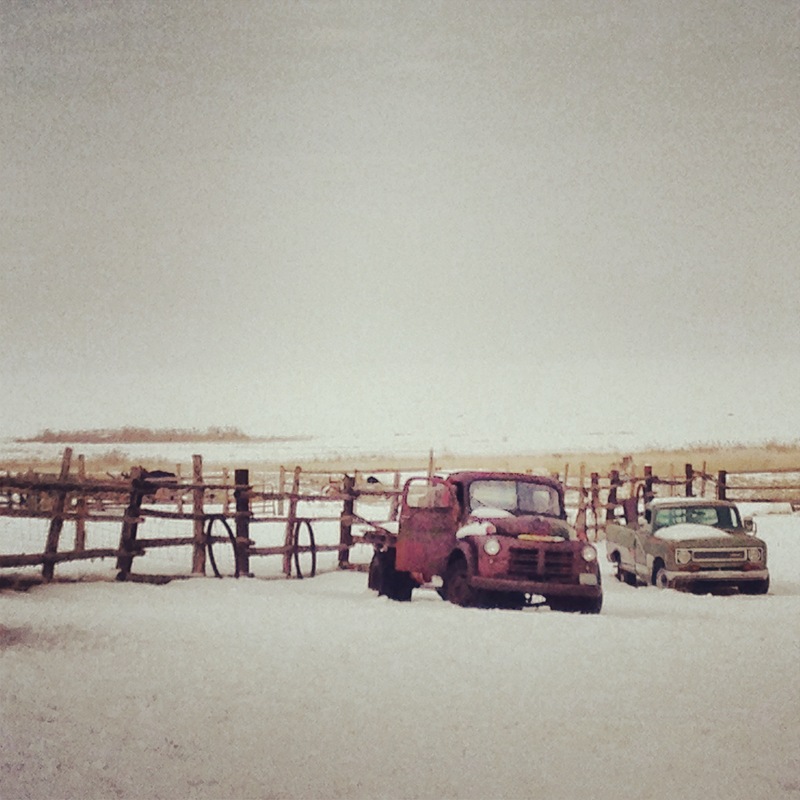 Yes, surprises await you at Antelope Island. Beautiful images! And what a blessing to live in a place surrounded by such beauty. Denisebushphoto, thank you so much for visiting and glad you like the images. It certainly is a blessing to live here. The island looks wonderful and I am impressed by the buffalo. Mr. Tootlepedal, the island is indeed a wonderful place. We have an annual pass for this state park and so we visit it often during the year, and every time it’s different. 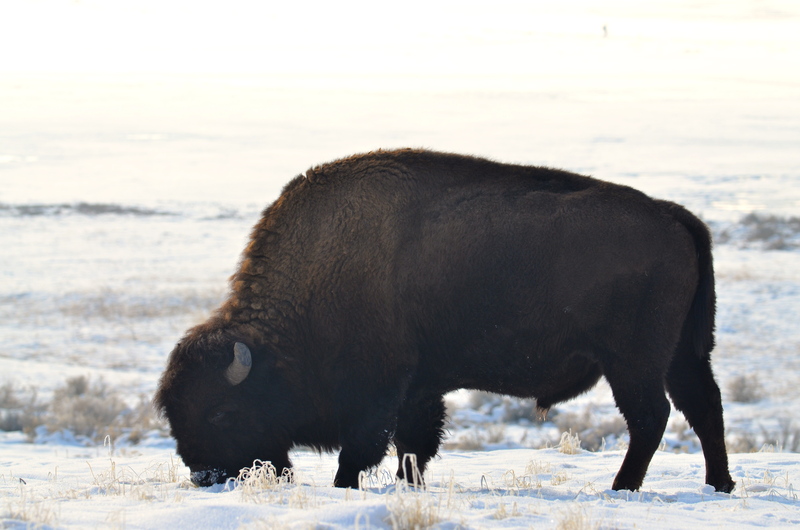 But the buffalo remain the same–big and impressive, indeed.